Growing herbs in pots is a great solution for the gardeners who don’t have a huge space to experiment with. Most people prefer to do this because it offers them the chance of using fresh culinary herbs in their cooking. Moreover, you can harvest them any time of the year, regardless of the weather outside. 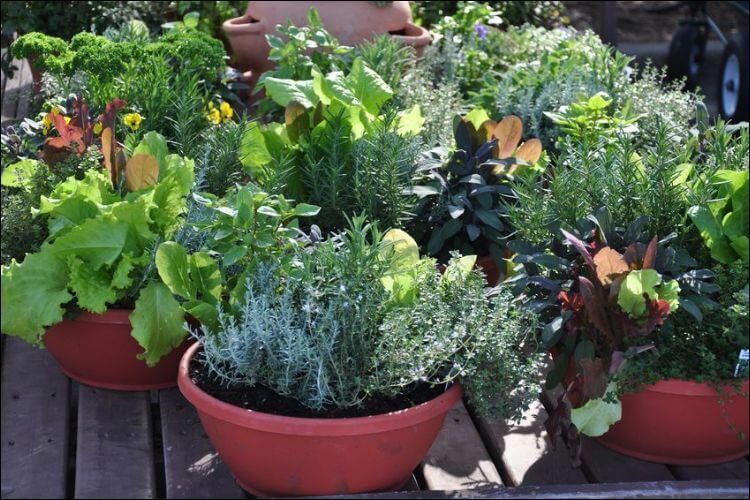 Let’s see how you can learn to grow herbs in pots by following some simple steps. 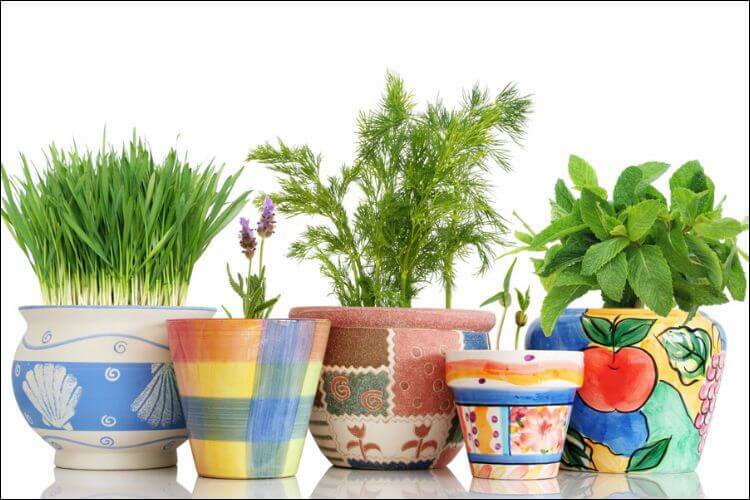 Naturally, the first step when you decide on growing herbs in pots is to choose the pots you are going to use. Luckily, there are countless options on the market, from style to color, size, and material. Plastic isn’t recommended for this since it can deteriorate in time if you keep it outdoors. You can also choose ceramic, stone, or cement containers, which are more durable, but also heavy and difficult to move around. What’s important is that they have drainage holes at the bottom. Go for a size of at least 8 inches. If the container you use is too small, the herbs can turn out root bound. It’s better to choose a lightweight pot, such as a clay one, just in case you need to move it around. Moreover, they are more appropriate if you plan to keep them in hanging baskets as well. The hanging baskets go well with some window boxes too, so consider this arrangement. The next thing you need to do is to fill the large pots partway. For this, use some lightweight material: Styrofoam, wine corks, etc. This step will cut down on the amount of soil you need for the pot. Too much dirt and you will have your herbs concentrating on producing more roots instead of leaves. Another option would be to place a smaller empty plastic pot upside down, right in the center of the large pot. Growing herbs in pots require you to use some good potting soil. However, if you decide to use dirt from your garden, you may bring pests into your home, which can destroy the herbs. Moreover, the garden dirt tends to be rather dense, which means it can’t drain well. Make sure the soil you use is a quality one. Mix organic fertilizer well with the potting soil into a large pot or any other container you are using. The soil in pots tends to dry out quickly, which means your plants won’t be getting their nutrients. As such, adding organic fertilizer will help you maintain the plants healthy. Once you’re done mixing the soil together with the fertilizer, it’s time to fill the planter. Fill the entire remaining space. 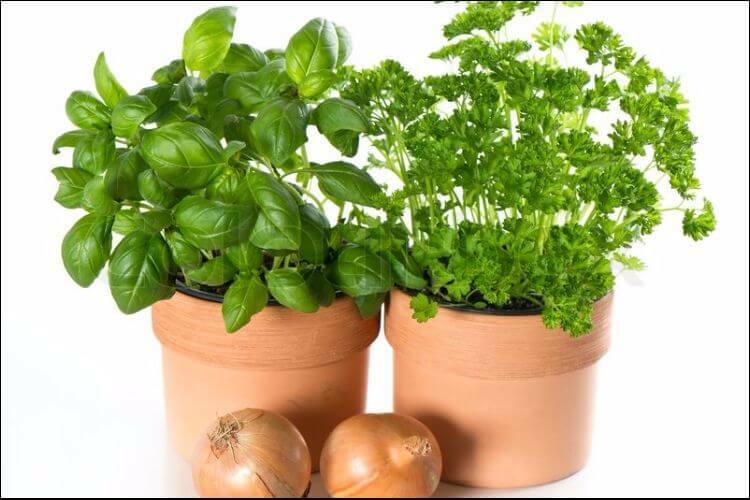 Another important element when growing herbs in pots is to choose the right plants. One of the factors you need to consider is the taste. Grow something that is useful to you and which you intend to use for cooking. If you’re into indoor vegetable gardening as well, you can choose herbs that pair well with the vegetables you have. For example, tomatoes go well with basil. 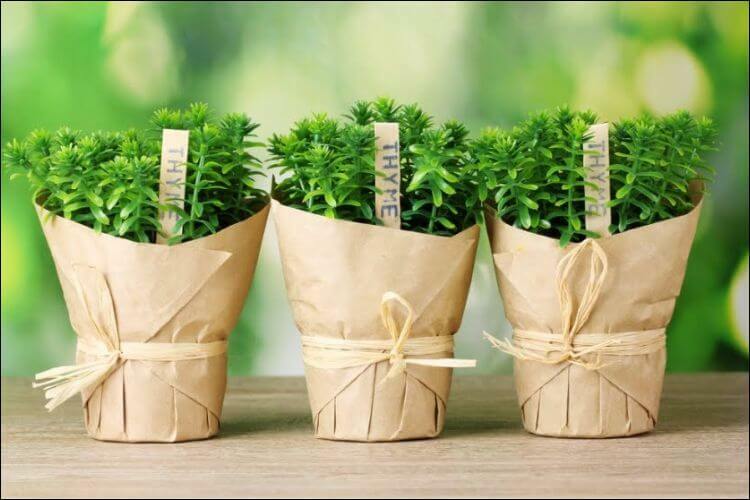 If you’re into growing herbs in pots, then you should know you have two options: either you plant the herbs from seeds, or you buy the herbs from a store and transplant them to your pots. In case you decide to buy the seeds, just follow the instructions on the package. Ensure the adequate depth and spacing for each type of herb you use. If you decide to transplant, just make a hole that is deep enough for the roots of the herb. Then, put the plant in the hole and tamp down the soil around. Each pot needs to be placed in a tray or a type of shallow bowl. This ensures that the drainage water won’t damage anything in your home or outdoors. You need to water the plants thoroughly, yet gently. Many people choose to plant several plants in a single container. They do so because they want to save some money or because they think it will look pretty. There’s nothing bad in adopting this approach, though you need to pay attention to a thing or two. 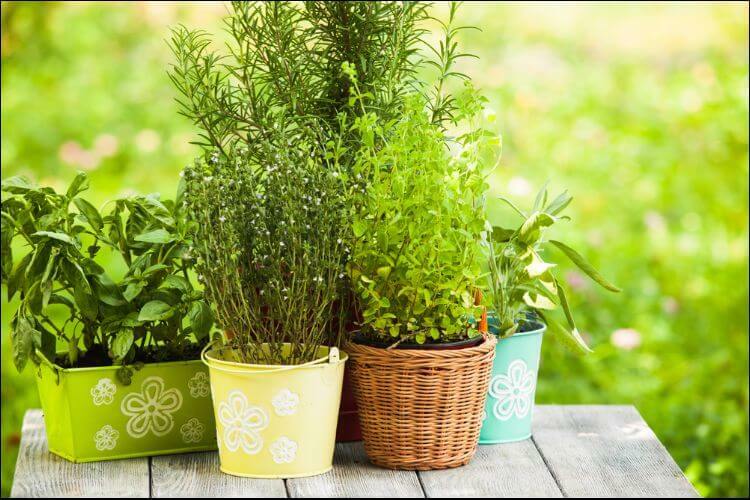 First, make sure that the herbs you plant in the same pot have the same requirements for water, sun, and soil. For example, parsley prefers steady moisture, while rosemary wants the environment to be hot and dry. 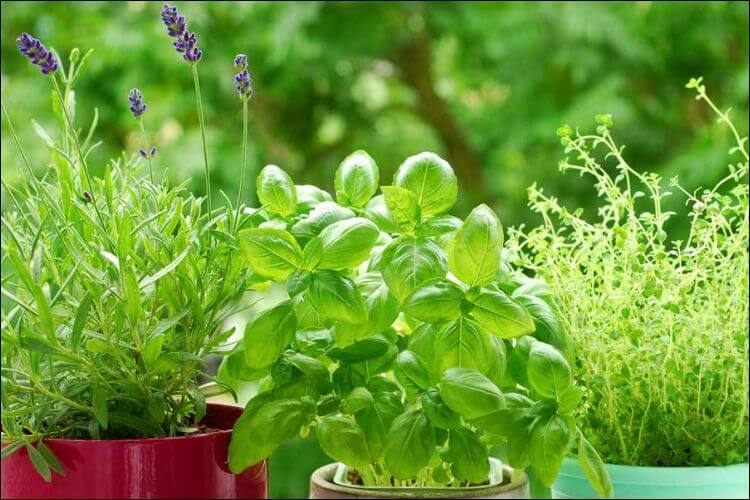 Growing herbs in pots together may still yield some successful results. A solution to offer the proper air circulation (like basil needs, for instance) is to pinch the herbs back and harvest often. In this way, they’re not going to suffocate each other. Alternatively, you can just choose some small herbs and let them grow wildly in a pot. The aesthetic effect will be very much appreciated by anyone who visits your home. 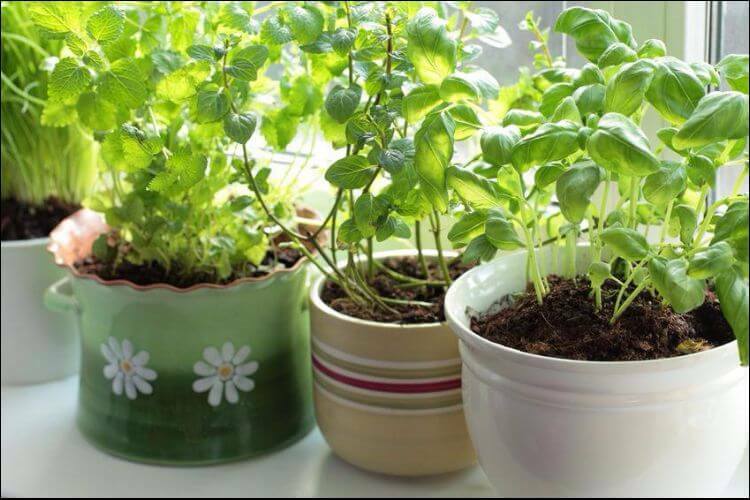 A good idea for many herbs is to use self-watering containers. Chives, marjoram, parsley, and mint love this arrangement because they prefer a constant moisture level. 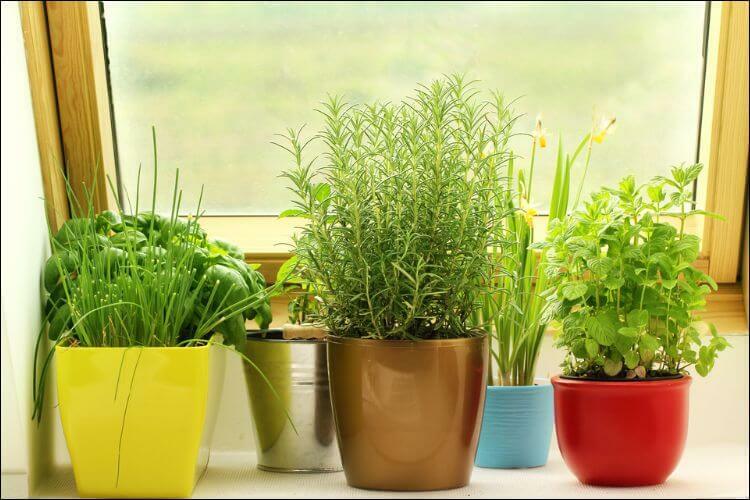 However, other herbs (such as thyme, rosemary, oregano, and basil) like to dry out between watering, so a self-watering container wouldn’t be a good option for them. There’s one rule here: the more you pick, the more you’ll have. Pinching your herbs back will help them become bushier, for example. Keep in mind that some herbs don’t like to be cut back entirely. An herb container is an original gift for someone who loves gardening. You can even have a themed herb container to give out, such as a pizza one, containing all the herbs you need when you cook a pizza. Alternatively, you can also combine edible plants and herbs in a beautiful basket. You can even make your own herbal bouquet, just make sure that the person receiving it would love such an idea. Preferred for its special flavor, basil loves full sun, but not direct sunlight. Keep it in a partly shaded area during full summer. This may cause it to dry out fast, so make sure you provide regular watering. However, if it’s not wilted, you can water it less frequently. People cook it with tomatoes and it’s a great option for pizza. Luckily, parsley is perfect for growing herbs in pots because it’s not very choosy. It can thrive in perfectly normal conditions, but you need to ensure it proper soil drainage. Keep in mind that it doesn’t like to have extremely wet soil, so don’t overdo it when watering. An excellent choice for lemonades and chocolate cookies, mint is an herb that enjoys partial shade and moist soil. It’s famous for being an invasive herb, so don’t place it together with other herbs in the same container. Professional gardeners recommend you not to keep it too close to other pots with plants. The reason is that it propagates extremely easy and it can become difficult to control. This plant prefers well-drained and moist soil, as well as partial to full sun. Just like basil, leave it a little to dry out before watering again. Don’t mist it, nor water by soaking it, otherwise, you may end up with some fungal diseases. Growing herbs in pots is an easy thing to do, even if you’re a beginner in gardening. People love this practice because they can protect their plants from the harsh weather in winter, as well as from the pests that can appear in the regular garden soil. Make sure you offer your herbs the right soil, light, and water conditions and your dishes will taste better in no time!